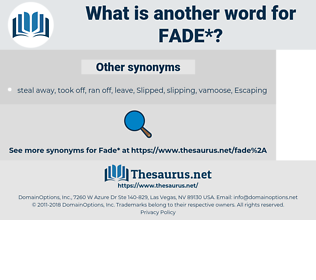 What is another word for fade? become less clearly visible or distinguishable; disappear gradually or seemingly; " The scene begins to fade"; " The tree trunks are melting into the forest at dusk"
not amount to much/a great deal. cases, diminish, weaken, meddle, erode, decrease, dilute, evaporate. bloom, win, grow, solidify, fight, prolong, extend, raise, rise, free, increase, develop, go up, expand, coagulate, enlarge, reach. brighten, darken, color, enhance, recover, improve, strengthen, sharpen, appear, arrive. come to life, pattern, splotch, speck, paint, marble, dye, embrown, exist, be born, survive, stripe, pigment, blotch, dapple, tincture, spot, checker, streak, discolor, come into being, begin, emerge, blacken, break out, speckle, stain, tint, striate, variegate, flourish, tinge, deepen, polish, loom, shine, tarnish, gain, rally, daub, live, rebound, shade, mottle, burnish, issue, fleck, polychrome. But when the colours of the sky fade away and the blinds are drawn down over the windows of heaven, then my heart tells me that evening falls just for the purpose of shutting out the world, to mark the time when the darkness must be filled with the One. Imagine a race with a perfect memory - one which does not fade. 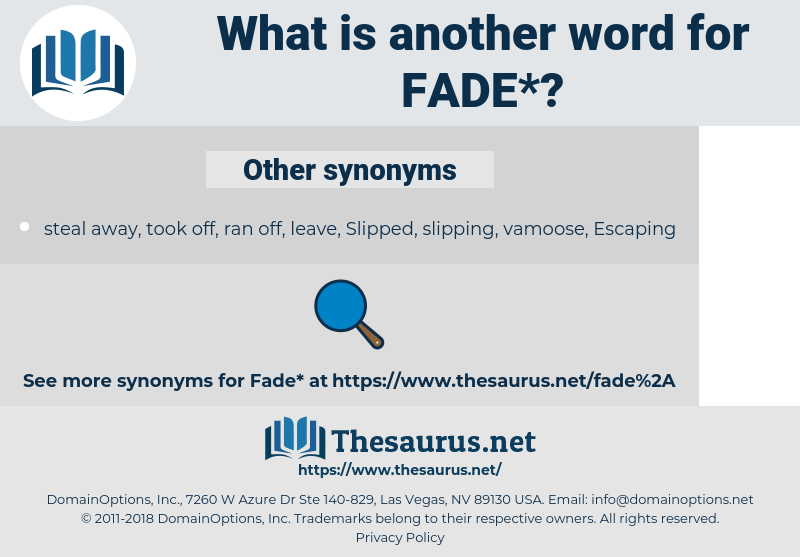 fayed, faddy, fit out, fade away, fatwah, fifty-two, ft, fete, fatwa, fiftieth, faith, fate, fed, foot, fifty, fad diet, fated, fathead, fete day, foodie, FPD, footed, fuddy-duddy, faded, Fet, FTO, fiat, fad, Fatah, fatheaded, food, fadeout, Fatiha, fit, fat, fitted out, fade out, fahd, feat, feud, fado, foetid, fda, feed, fatty, Fatihah, fatuity, fetid, fifth. conclusion, golf shot, termination, golf stroke, ending, swing. go away, disappear, weaken, vanish.